While the Newberg and Dundee area has long been known for its wine production, having become a destination for many seeking to sample high end vintages, rural Dundee will soon become home to a new tasting room for a different kind of beverage. A new building at the corner of Riverwood Road and Highway 99W will eventually become home to Odin's Beard Meadery, which will be a production facility and tasting room with seven lines of mead, which is often referred to as honey-wine and is made by fermenting honey with water. 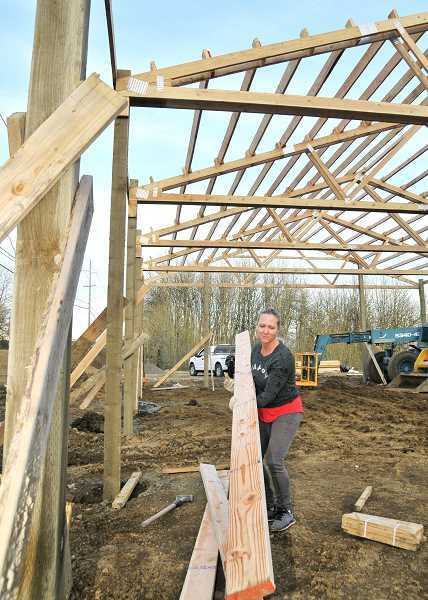 Owners Danielle and Warren Burk are building the production facility and tasting room themselves, with occasional help from young son Quentin and friends. Warren Burk is a full-time contractor who works on the meadery in his free time. The couple owned Dusty Bottle Meadery in La Center, Wash., but that closed recently and this new facility brings them closer to where Warren Burk's firm is headquartered in McMinnville. The Burks said they pulled out of Dusty Bottle as it wasn't making enough to continue expansion. Most of its sales were around Oregon as there product is sold in 20 locations. "We wanted to bring diversity with a different type of wine," Danielle Burk said. They have a tentative opening date of July 4, although by building it on their own they do face challenges. "There's a lot of building ahead of us," Warren Burk said. Matt Vogt, assistant planner for Yamhill County Planning and Development, confirmed the project, saying the applicants first came before the board last March and got their application approval in the summer. He said the new buildings will be a 2,000 square-foot production building and a 1,200 square-foot tasting room. 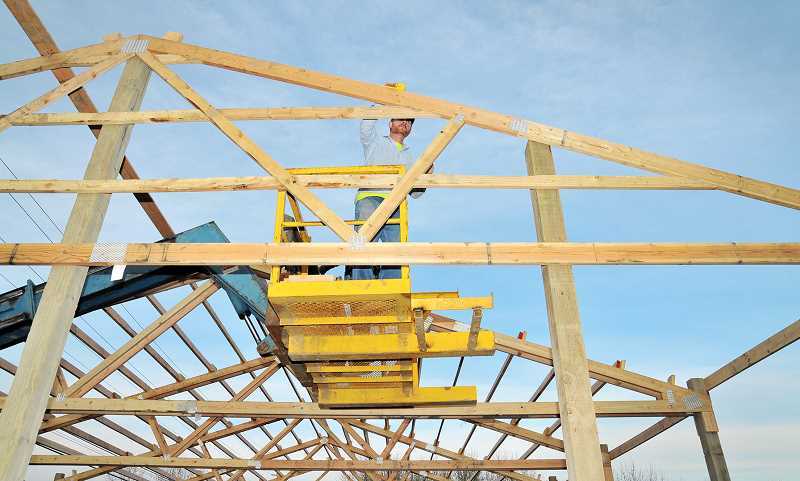 "They got their building permits in November, I know that they're hard at work," Vogt said. Speculation over what was being built on the parcel began on the Newberg-Dundee Citizens Info Group Facebook page in mid-January. Odin's Beard products are available for sale in nearby locations such as Harvest Fresh in McMinnville, the Mead Market in Portland and the ABV Public House in Hillsboro. The company's website describes itself as "proud to be bringing a new taste to the Northwest with our honey wines. We (were) one of the first meaderies in Clark County and are proud of this achievement." Danielle Burk said the business started with a home brewing kit and it grew from there. The name Odin's Beard comes from her family's Swedish and Norwegian background. While most meads are extremely sweet, like a dessert wine, the Burk's said they make dry meads. For example, their blackberry mead has the characteristics of a dry red wine, they said. Danielle Burk added that the business will focus on "standard mead" and some of their concoctions are aged up to four years. "We have Melomel's, Metheglen's and standard meads …," she said. "Right now we have been focused on dry's and semi sweets." According to the application with the county, the lot where the facility is being constructed was formerly vacant. The tasting room will have a metal roof with concrete composite siding, a double French door style entry with a few tables and chairs inside, and a bar to serve on. The application states "We will not alter the character of the surrounding area but enhance it and work with it," and that the "proposed use is appropriate with the access to Riverwood (Road)." Surrounding uses are farm, commercial, rural and a winery. "We will be the first Meadery in the Dundee area," the application states. "We will be providing some diversity in the wine community with our mead and fruit wines." The application was approved in June. Applications are now being accepted for farms to be added to the Oregon Century Farm and Ranch Program. The program awards the designation to families in the state who have farmed portions of family acreage continuously for the past 100 or 150 years. The deadline for applying for the 2019 award is May 1. Application documentation may include photos, original deeds, personal stories or other historic records. These records help support Oregon's agricultural history by providing valuable information about settlement patterns and statistics on livestock and crop cycles. All documents are archived for public access. City offices in Newberg and Dundee will be closed Feb. 18 in observance of Presidents' Day. Newberg's compost depot will also be closed that day for the holiday. Both cities will reopen for business the next day, and both have City Council meetings the evening of Feb. 19.